Do you know who deserves the big bucks at that fancy French restaurant you love so much? It’s the saucier (the sauce maker)! These alchemists are the most talented at balancing flavors to create the personality of the dish it accompanies. Learning how to make sauces is definitely one of the most important ways of enhancing the flavor of your food. As I shared in the Stocks section, fundamental to good sauces is a good stock. In fact, in order to achieve the depth of flavor and complexity you experience when you eat a restaurant-prepared sauce, you must use good stock. Foundational to all sauces are the five sauces that are referred to as “Mother Sauces”. 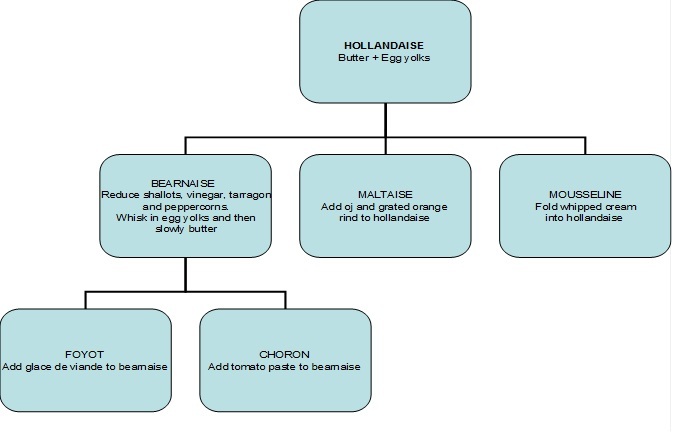 Each uses a different technique and serves as the basis from which all other sauces are derived. Therefore, if you can master these five sauces, you then have the ability to make a myriad of delicious sauces. 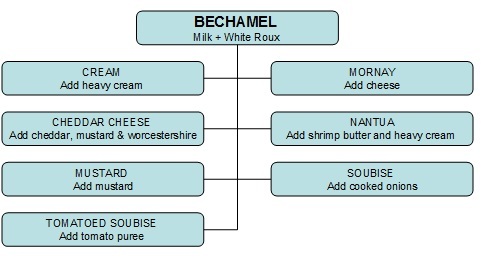 Below is a detailed explanation of how to make each of the Mother Sauces. 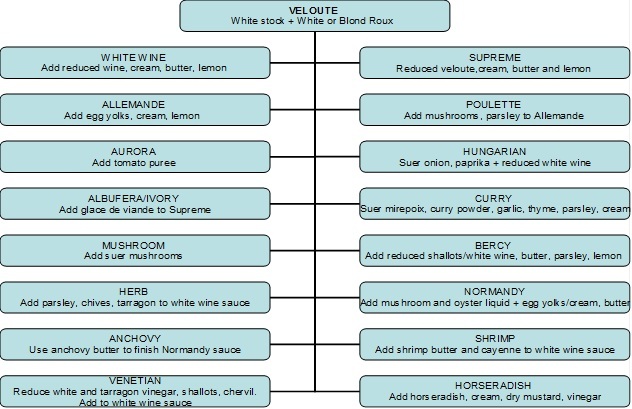 And following this chart, are a set of diagrams detailing which sauces are derived from each of the Mother Sauces. 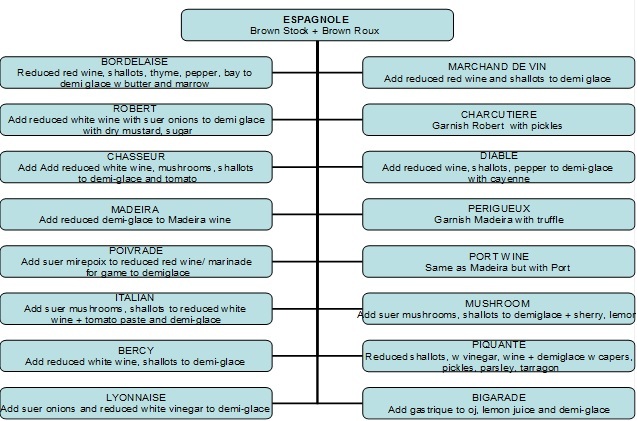 If you’ve ever wondered what’s in all of those fancy-sounding French sauces, this is your guide! 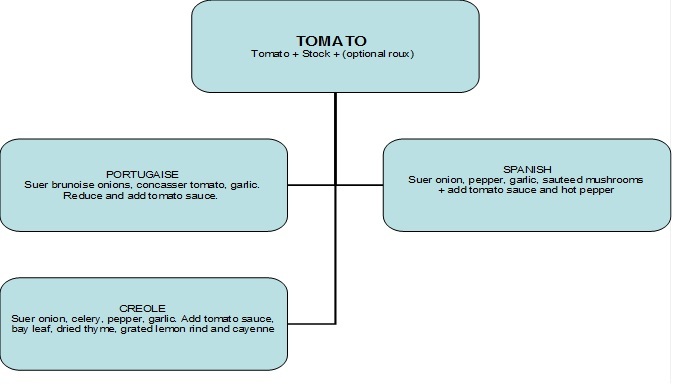 As promised above, the following diagrams demonstrate the derivative sauces of each of the Mother Sauces. Each requires that you first prepare the specific Mother Sauce and then continue with the added ingredients detailed in each box. thanks for this. very nice notes realy helpful…….. I was blessed by your hard work. Thank you Jesus bless you. Very simple & easy to understand notes. very thanks for sharing this!